For those days when your travel expeditions are a little closer to home. Any time is a wonderful time to get outside with the kids. But there's never a better month than May for a stroll, walk, or hike outdoors. Tote a great snack: Take a pass on a processed granola bar in favor of some healthy food inspired by some of the nature you might see around you. A few leaves and mushrooms are just as you'd find them for munching on—but of course, not exactly as you'd find them in nature because these are organic, purchased from a farmer, and, ahem, washed carefully at home first. Raisins, nuts and seeds have the same appeal. We've picked some sunflower seeds and walnuts for our nuts, and also packed our usual carrots, celery and broccoli in perfect sizes for little hands. 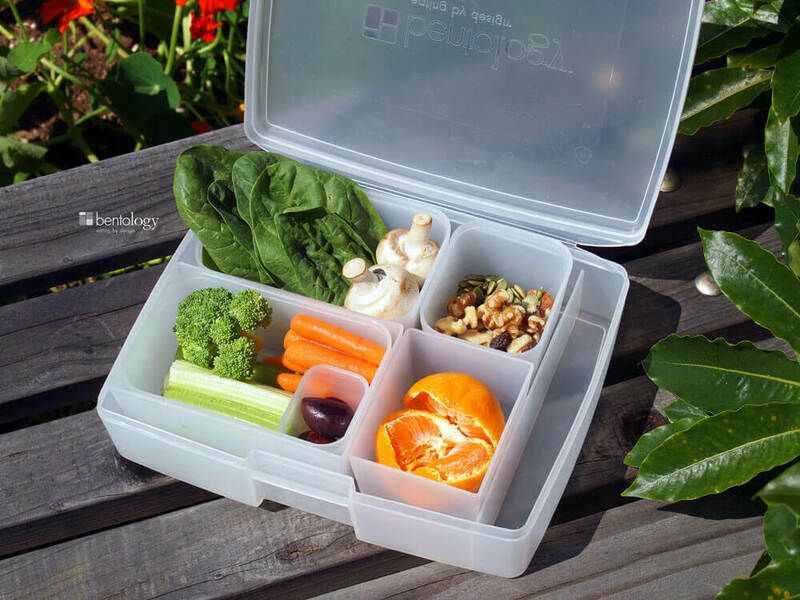 This bento also works as a vegetarian lunch and would be great for anyone interested in portion control. Add a little protein to this mix, and you've got yourself a Paleo bento buffet. Shown above, our neighborhood-stroll snack, packed to go in our Portion Perfect Bento Set, with lidded and open containers.